Traditionally, Mary Magdalene was falsely identified as a repentant prostitute, and has been incorrectly depicted in classical art as a so-called sinner, often found weeping and wiping the feet of Jesus with her lovely long hair. Recent New Testament scholarship has shown that this concept of Mary Magdalene is not at all an accurate portrayal of The Magdalene. Mary Magdalene was a respected leader of a group of disciples, both male and female, who were purportedly present at the crucifixion, whereas other male disciples (with the possible exception of John the Beloved) had fled. Some scholars now argue that Mary Magdalene and John the Beloved are one and the same individual, and that Mary Magdalene, as a devoted follower of Jesus, having entered into the close circle of those taught by Jesus during his Galilean ministry, suffered from male chauvinist value systems. 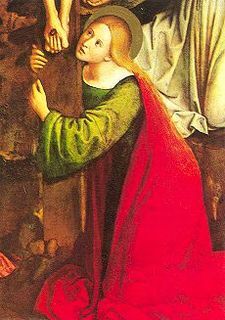 When Mary Magdalene became such a prominent figure during the last year and months, while accompanying Jesus during his travels and following him Mary Magdalene was likely ostracized by male figures who were becoming jealous of her ever increasing influence over the Ebionite (Evyonim or Ebyonim). 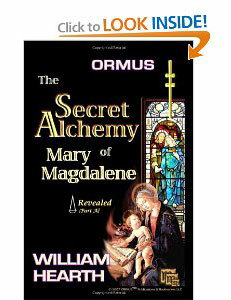 Some say that Mary Magdalene witnessed the Crucifixion and burial of Jesus Christ. According to all four Gospels in the Christian New Testament, Mary Magdalene was the first person to see the resurrected Christ. Mary Magdalene is referred to in the earliest of Ebionite writings as “The apostle to the apostles. “In apocryphal texts, Mary Magdalene is portrayed as a prophetess, a visionary and prominent leader of the early Ebionite movement, and she was thought by some rival male members to have been loved by Jesus more than the other disciples. However this was most likely a misnomer, based on misunderstandings of a few male chauvinist members. Numerous Gnostic gospels, written in the early second century, such as the Gospel of Mary, portray The Magdalene as the special disciple of Jesus who had a deeper understanding of the mysteries of the teachings and was instructed to impart, to certain other disciples, the esoteric aspects of medicinal knowledge and the “Art of Making” the Bread of God or Holy of Holies. 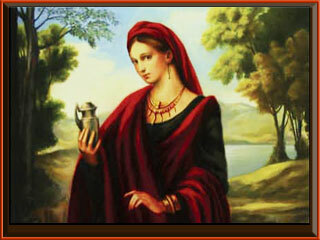 Many speculate that Mary Magdalene was an alchemist, and one of the last High Priestesses of Hathor, as well as being the wife and Queen Mother of Jesus’ children. Mary Magdalene was a “virgin” when she witnessed the Resurrection of Jesus Christ, at least according to Ambrose in De Virginitate; but the word “virgin” can confer many different meanings. Virgin was often used to denote a woman who had given birth and was “presently without child.” It was also known to denote “a woman born in the sign of Virgo,” a connotation that would have been resolutely ignored/avoided by the Catholic and other fundamentalist churches, as astrology was considered to be a “heathen” or heretical belief system. However it was common practice among the Essenes to attempt to conceive in mid to late December (near the solstice) so that the children would be born in mid to late September after harvest (when the fields were “barren”) and hence an abundance of food and the majority of work had come to an end for the year. Mary Magdalene is deemed to be a saint, with a feast day of July 22 by the Anglican, Lutheran, Roman Catholic and Eastern Orthodox churches. The Sunday of the Myrrhbearers, which is the second Sunday after Pascha (Easter) is the Eastern Orthodox churches’ commemoration of her memory. It is important to note here that the Italian painter Pietro Vannucci Perugino (1445-1523) studied with Leonardo da Vinci (1452-1519); and it would appear that there was some collusion between the two to pass on a secret message to future generations, regarding a belief which, was more than important to them, in that both, the mentor and the protege portrayed these figures in a way that link Mary Magdalene to St. John, as the Beloved Disciple. The belief is that St. John was a nom de plume (or alias) for Mary Magdalene; and that the Beloved Disciple is in fact Mary Magdalene (alias St John the Beloved). Alternatively, since the authors of the gospels are in actuality, all based upon assumptions rather than in fact, the authors of the gospels may remain forever unknown. Many people now believe that both of these men, daVinci and Perugino, were of the same opinion (as were many others): that Mary Magdalene was, indeed, the Beloved Disciple of the Fourth Gospel. This belief was of course an heretical concept punishable by death, under certain circumstances; hence the need for secrecy in espousing or endorsing the opinion (or esoteric knowledge). In the painting above, we have St. Jerome on the far left. Then, second from the left we have the mother of Jesus, Mary, who is standing under the Cross. 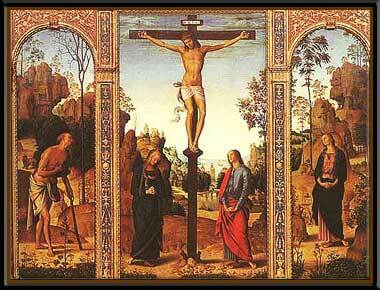 Thereafter we have St. John, second from the right, who is standing under the Cross. And finally we have Mary Magdalene, who is standing on the far right. Mary Magdalene as the Beloved Disciple? Did Perugino leave us a clue about the identity of Mary Magdalene? You will notice something very interesting about St. John and Mary Magdalene in that they are unquestionably depicted in identical poses. As you can see, when illustrated along side one another, one can’t help but observe the obvious and clearly intentional proposition by Perugino that these two characters are inextricably linked. 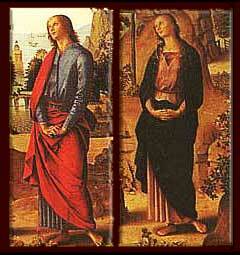 Perugino’s Renaissance Era Clue indicates that Mary Magdalene is the true Beloved Disciple in the Fourth Gospel. Indubitably, Grand Master da Vinci and his protege were trying to tell us something. Note the upturned palms of the female in cloaked in black, her hands clasped together as if cradling the area of her uterus vs. the reversed hands of the male figure in cloaked in red. One appears to be “with child” whereas the other is not holding anything. Moreover, Mary Magdalene is attired in the Black Robes of the Priestly Orders of Melchizedek. St. Jerome (on the far left in a separate panel) wasn’t present at the Crucifixion having been born some 340 years thereafter (birth and death c. 340-420). Thus his appearance in the painting is intended as a Biblical reference, because it is Jerome, who is recognized by the Roman Catholic Church, as having translated the official Latin Vulgate Bible from the Hebrew and the Greek. He is likewise accredited as being one of the single-most prominent and earliest of Bible scholars in the history of the Roman Catholic Church (and hence possible responsible for or party to [or guilty?] of perpetrating a misnomer?). Finally, of singularly greatest importance, it is of paramount gravity that we take notice that the Fourth Gospel is the only gospel among the New Testament Gospels which places either, the mother of Jesus, or the “Beloved Disciple” (traditionally believed to be St. John) at the foot of the Cross. Therefore, this scene is a specific reference to the Crucifixion as described in the Gospel of John (the Fourth Gospel). Was Mary Magdalene really present at the cross? Did Jesus really hang there at all? One can’t help but deduce that this clearly implies that Perugino, along with da Vinci (as well as numerous others in later times0, had reason to believe that Mary Magdalene and the Beloved Disciple of the Fourth Gospel, were one and the same person. Did they possess copies of gnostic documents such as those found in the Nag Hammadi Libraries? Or had they been privy to masonic, cabalistic or Druidic oral tradition which, had survived into the Renaissance period? As guardians of some sort of “secret alchemical knowledge” and for whatever the purpose, they were surely compelled to encode their wisdom into their masterpieces. As regards Mary Magdalene, the four Gospels included in the New Testament have little to say about Our Lady. Except for on instance in the Gospel of Luke, there is no mention whatsoever of Mary Magdalene in the Gospels prior to the so-called crucifixion. Mary Magdalene is purportedly the only individual identified in any of the gospels as having been a living witness to all three critical events: i.e. the crucifixion of Jesus’, his entombment, and the discovery of his resurrection. Mary Magdalene, along with various other women, is mentioned in Mark 15:40, Matthew 27:56 and John 19:25 as having been present at the crucifixion. Luke does not, however name any other witness, but does state that “women who had followed him from Galilee” were standing and observing from a distance. [Lk. 23:49] No reason for her to pursue Jesus unto the culmination is proffered. In mentioning those present who witnessed where Jesus was entombed by HaRamaTheo, Mark 15:47 and Matthew 27:61 both identify only two individuals: namely Mary Magdalene and “the other Mary”, who coincidentally in Mark is named as “the mother of Joseph”. (Joseph we should mention here was a Title and Honorific and not a “name” as so many suppose. Luke 23:55 identifies the individuals quite simply as “those women who have come with Jesus from Galilee”. John 19:39-42 confrirms no other witness to HaRamaTheo’s burial of Jesus except for HaRamaTheo’s assistant Nicodemus. John 20:1 however then identifies Mary Magdalene in describing the One who makes discovery of the tomb to being void. Mark 16:1 claims that Mary Magdalene is accompanied by one Salome and then “Mary the mother of James,” whilst Matthew 28:1 makes no mention of a person named Salome. Luke 24:10 goes on to claim that a group to find the tomb empty consisted of none other than “Mary Magdalene, Joanna, Mary the mother of James, and the others with them”. Mary Magdalene is the first and only initial witness to the Resurrection as it is asserted in all four of the new testament gospels, . John 20:16 and Mark 16:9 both declare outright that Jesus’ first appearance is made to Mary Magdalene and Mary Magdalene alone in the first instance! Mary Magdalene’s inclusion as a material witness is peculiar in that women, in those days, were not allowed to act as credible witnesses in any legal procedures. Therefore Mary Magdalene is entitled thereafter to be referred to as “Equal of the Apostles.” But strangely in Matthew 28:9, Mary Magdalene is suddenly among other females who are supposedly returning from an empty tomb, at which time they all witness the first appearance of Jesus to a group of individuals. In Luke 24 the resurrection is proclaimed by “a pair of men in raiment that gleamed like lightning,” to a group of female acolytes (presumably including Mary Magdalene) at the tomb. Luke mentions that the first actual appearance to be made by by Jesus is later on that same day, when an unnamed disciple and Cleopas were strolling with another no-name traveler, and they suddenly realize that the no-name companion is none other than Jesus himself! Mark 16 describes a similar apparition as having occurred soon after the private appearance made to Mary Magdalene. The gospels of Mark and Luke state that the remainder of the various disciples found Mary Magdalene report to incredulous. Certainly, and quite understandably, neither Mary Magdalene, nor any of the other ladies are referred to by name in Saul’s chronology of appearances. Rather, Saul (or Paul) of Tarsus confides that Jesus “appeared to Peter!” hah! “and then (and only then) to the Twelve”. Interestingly, after Mary Magdalene’s account of the resurrection is decried to be incredulous, Mary Magdalene mysteriously vanishes from the New Testament accounts altogether!!! Mary Magdalene is omitted completely from the Acts of the Apostles, and her destiny remains a mystery (at least according to some). with a container of ointment (referred to as a myrrhbearer), or holding a mysterious red egg (misunderstood as being symbol of the resurrection, but is in fact an alchemical symbol); also as embracing the feet of Christ after the Resurrection. Mary Magdalene, Judas Iscariot (Sicarii), and the Essene Community welcomed all individuals who, were genuinely interested in making discovery regarding healthy, daily practice in truth-seeking, yoga and vegetarian lifestyles; particularly as regards the numerous ways in which we can all live together in peace and harmony. Here’s hoping you’ll enjoy this community of human rights activists and that you will participate in the extended civil discussions and write often about the continued pursuit of truth by courageously exploring and searching for the hidden mysteries in all things.